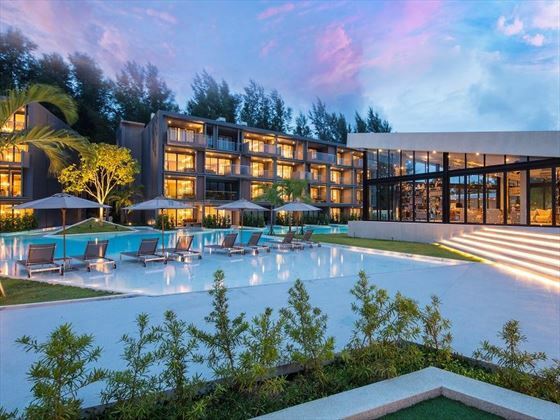 Inspired by the verdant, tropical scenery of luscious emerald flora and azure shimmering ocean which surrounds the property, La Vela is anchored on one of Khao Lak’s most serene, beautiful stretches of powdery white sand beach. This tropical escape features a delightful blend of contemporary décor and rustic charm throughout 181 stylish, spacious rooms, four ambient restaurants and a fabulous range of pampering facilities, whilst the friendly staff welcome guests from all around the world with exceptional, glowing hospitality. The resort is comprised of two distinct zones – Oceanside and Poolside. There are eight breath-taking room categories to choose from, each beautifully-appointed with local contemporary décor, luxurious amenities and unforgettable views of the tropical gardens, sparkling pools or azure ocean horizon. 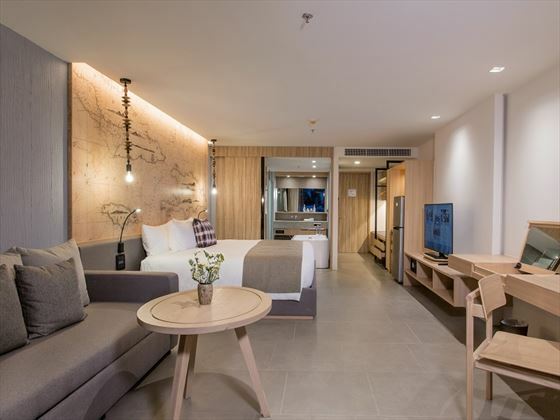 All rooms are equipped with a whole range of comforts and amenities, including a stylish bathtub or outdoor Jacuzzi, an expansive private balcony, comfortable lounge area, glass walk-in shower, free high-speed Wi-Fi and plush king-size beds. Some rooms also offer direct access to the beach and zero-entry access to the pools. Dining at La Vela is an eclectic experience for all culinary connoisseurs, with the choice of two ambient restaurants serving an exciting blend of international specialities cooked to perfection by a team of expert chefs, in addition to an inviting café and a modern poolside bar with gorgeous ocean views. The resort’s on-site spa offers a rejuvenating selection of signature massages, restorative therapies, facials and body treatments within five beautiful treatment rooms, whilst the three infinity-edge pools dotted around the property are blissful spots to unwind and soak up the gorgeous surroundings. The resort also offers a great selection of family-friendly facilities, including a fun kid’s club, kid’s pool and dedicated family rooms. Nestled on Khao Lak’s most serene stretch of powdery white-sand beach named Bang Niang, La Vela is around 2.5 kilometres north of Khao Lak Beach, but offers a more peaceful version of sandy bliss with more streamlined beaches and fewer people; there are also lots of stylish cafes, wonderful eateries and bars dotted along the coastline. 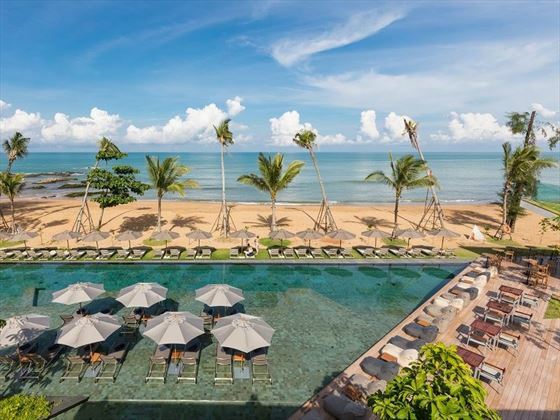 This barefoot beach escape offers a peak into another side of Khao Lak that is rarely seen by tourists. 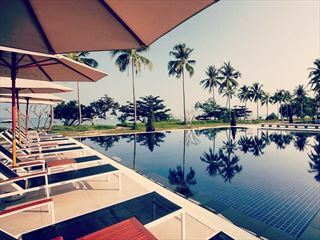 The resort is around an hour’s drive north of Phuket’s International Airport. 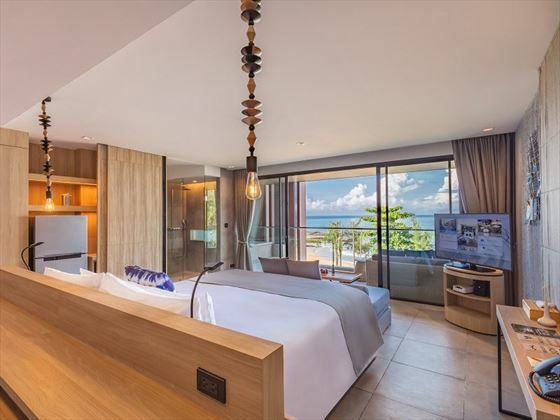 Offering 57 square metres of private living space, these spacious and stylish rooms feature all the comforts of a decadent tropical resort, with comfortable king-size beds, an open-plan closet, coffer corner and a luxury outdoor bathtub with tropical garden vistas. 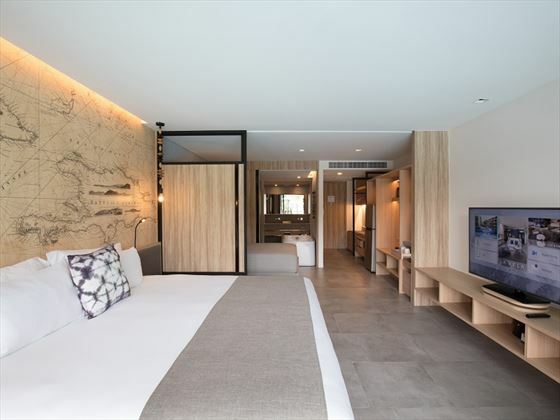 Each of these beautifully designed rooms are well-appointed with 57 square metres of serene living space, and the choice of a king-size bed or twin double beds. Beautiful floor-to-ceiling glass windows and a spacious private balcony overlooks stunning views of the pools, whilst a wide selection of modern comforts promise a comfortable stay, including a spacious bathroom and lovely living area. Offering splendid views of the surrounding pool and ocean scenery, these private 57sqm rooms are equipped with an outdoor bath and sofa to make the most of this spectacular environment, and situated in close proximity to the ocean. Featuring blissful views of the sparkling ocean horizon accompanied by the soothing sounds of crashing waves, these breath-taking 57sqm rooms offer a similar selection of amenities to the previous category, including a large outdoor bath, sofa, plush king bed and a large, luxurious bathroom. Guests who stay in these rooms will enjoy a private, fully-furnished terrace with direct access to the azure swimming pool. 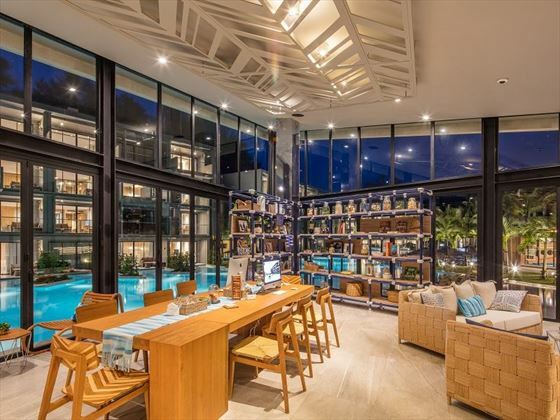 Featuring 52 square metres of sumptuous, contemporary living space, Pool Access Rooms come with the option of a king-size bed or twin double beds, in addition to a sumptuous en-suite bathroom, plush lounge area and a range of luxurious amenities. 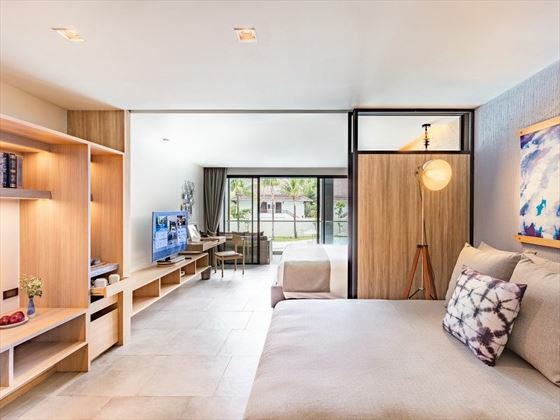 These gorgeously-appointed 54sqm suites are specially designed for families with a heightened level of privacy and a plentiful supply of modern comforts and luxurious amenities, including a private jacuzzi tub. 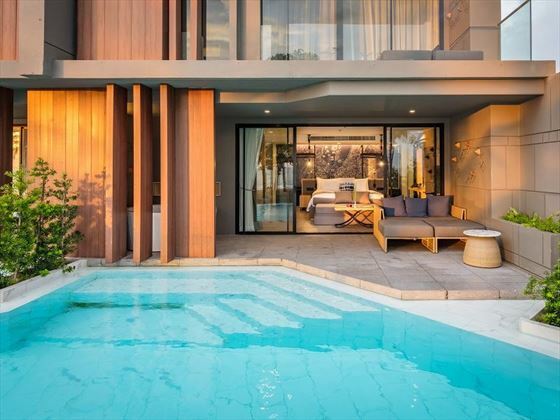 Offering a heightened level of luxury and private living space, these 60sqm rooms blend tropical style and comfort for a sumptuous holiday experience; featuring direct private access to the sparkling swimming pool and a pampering outdoor jacuzzi tub to admire the views and soak up the sunshine. What could be better than dipping your toes into the pool whilst gazing out into an endless horizon of glittering ocean waves? 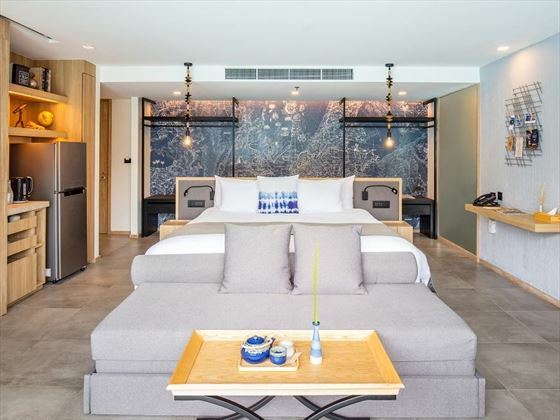 Located just steps away from the silky soft sand and azure sea, these 60 square metre hideaways are the ultimate beach retreats; featuring a fabulous selection of pampering amenities, plush furnishings and gorgeous décor. Whether you’re in the mood for a mouth-watering handmade pasta, crispy, freshly-cooked pizza or a bountiful selection of dock-to-dish seafood, Kukolo features a myriad of vibrant live cooking stations with expert chefs showing off their talent. Take a seat in the modern, ambient indoors or out by the pool, and relish every dish as you enjoy upbeat music. Kick-start your morning with a delicious breakfast buffet feast, presenting a diverse range of international dishes, from platters of bread, sweets and countless hot dishes lined up invitingly on the counter tables, along with coffee and other beverages to enjoy by the large windows with gorgeous garden views. As you enter, the rich wooden décor offers a welcoming and laid-back feel, and luscious emerald surroundings. A modern, stylish open-plan venue set beside one of the pools, Cotton Café is the perfect spot to lounge with a laid-back vibe, and enjoy a selection of fresh salads, sandwiches and other light bites to eat alongside expert-made artisan coffees, exotic teas, smoothies and espressos. Set adjacent to the picturesque Oceanside pool, this rustic-modern bar features an extensive menu which blends the exotic essence of the west with an avant-garde approach on local style – from light bites to eat to exotic, hand-crafted cocktails. 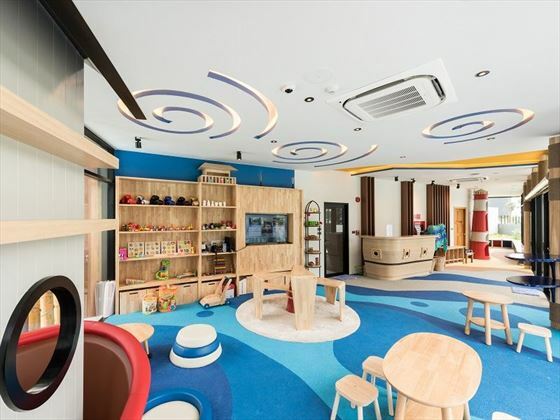 Petit Captain Kid’s Club – open daily from 9am to 7pm, offering a fantastic selection of fun activities for children to enjoy in a welcoming, safe and nurturing environment. 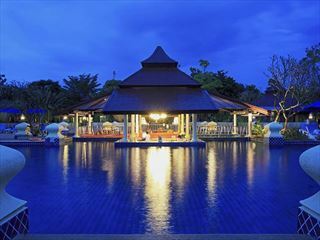 Surrounded by cooling lakes, rolling hills of lush tropical foliage and a magnificent beach. 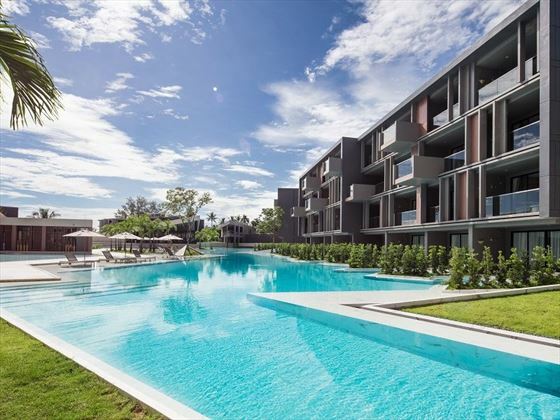 The area is known as Cape Pakarang, just minutes from the town of Khao Lak which offers shopping for local arts and crafts, cafes restaurants and a handful of local bars. Offering an adults-only resort during November to April. Well-located hotel offer fantastic amenities and a wonderful beach. 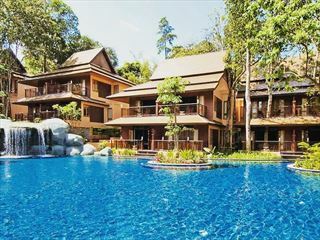 It has just been through major renovation work so it is now looking better than ever - a fantastic choice if you're visiting Khao Lak.